Originally a town within MILWAUKEE COUNTY, Granville is now a neighborhood located on the CITY OF MILWAUKEE’s northwest side. Created in 1840 by the territorial legislature, the Town of Granville extended north from Hampton Avenue to County Line Road and west from 27th Street and Range Line Road to 124th Street. The majority of this area eventually joined the City of Milwaukee, although some sections became the Villages of BROWN DEER, RIVER HILLS, and GLENDALE. The final ANNEXATION of Granville, in 1962, marked the largest territorial acquisition in Milwaukee history. The Town of Granville was settled by YANKEE-YORKERS beginning in 1835. Several of the earliest white residents of Granville migrated from Granville, Washington County, New York and named their new home after their old one. During the following decade, GERMAN, IRISH, ENGLISH, and Canadian immigrants arrived in the Town. Members of Granville’s German community were among the founders of the Wisconsin Evangelical Lutheran Synod, which held its first meeting at Granville’s Salem Evangelical Lutheran Church in 1850. From its inception, Granville was an agricultural community. Residential subdivisions began in the 1920s, but the area hosted farms even after its annexation into Milwaukee. After rejecting consolidation with Milwaukee in 1870, Granville confronted piecemeal annexation and incorporation. 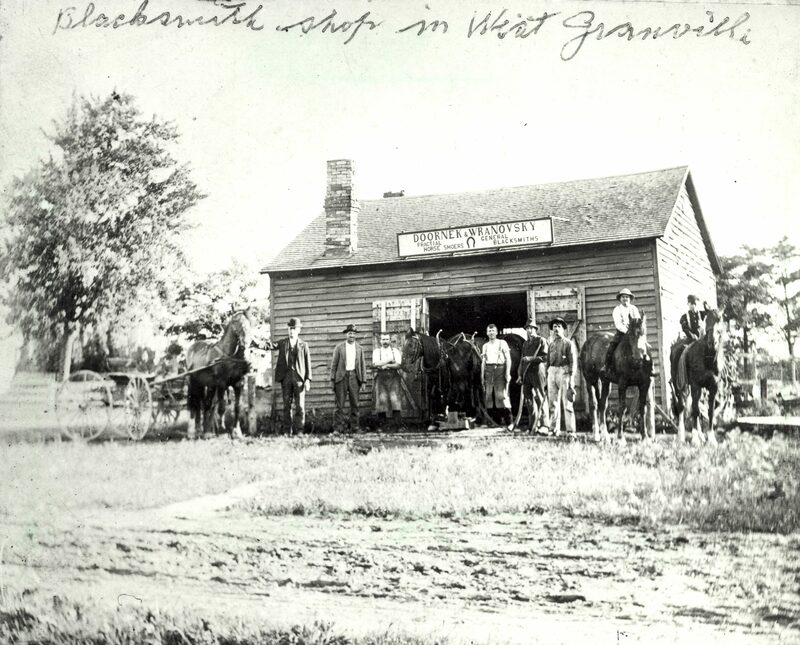 In 1897, the Village of North Milwaukee was incorporated on Granville’s southeastern corner. North Milwaukee consolidated with the City of Milwaukee in 1929. River Hills, in northeast Granville, incorporated in 1930. As Milwaukee expanded, Glendale and Brown Deer incorporated in 1950 and 1955 to stave off annexation. Milwaukee and Brown Deer launched competing annexation claims for the remaining portions of Granville. The majority of residents in the contested area voted for consolidation with Milwaukee in 1956, but other residents were drawn to Brown Deer’s lower taxes. The fate of Granville was left to the courts. In 1956, the Wisconsin Supreme Court gave Brown Deer temporary jurisdiction over the contested territory but three years later decided that Milwaukee had the greater claim. Finally, in April 1962, the Wisconsin Supreme Court decided that Brown Deer’s annexation ordinances were invalid. The Court awarded Milwaukee all but one-quarter of a square mile of the contested territory. Milwaukee added 16 square miles to its jurisdiction. The Town of Granville ceased to exist. As the incorporated municipalities fought over Granville, the Town existed in limbo. The changing tax bases and municipal boundaries left Granville’s schools, including a new high school shared with Brown Deer, unable to plan for their futures. In deference to the Milwaukee Police Department, the Milwaukee County Sheriff removed patrols from the portions of Granville claimed by the City, to the chagrin of Brown Deer residents. Protesting annexation, a group of Granville residents briefly declared an “Independent Granville” and elected their own government. Today, Granville is synonymous with Milwaukee’s far northwest side. Granville’s 1950 population of over 11,000 rose to over 45,000 by 1985. Most Granville residents live in ramblers, split-levels, apartments, and condominiums built since the 1950s. From 1973 until its closure in 2003, Northridge Mall was a retail focal point and major employer in Granville. ^ Pamela Rasche, Granville, Wisconsin: A History of a Growing Community (Milwaukee: City of Milwaukee Legislative Reference Bureau, 1973), 3. ^ Miriam “Mimi” Bird, “A History of Granville Township,” Manuscript, page 27, box 1, folder 1, A History of Granville Township Manuscript and Related Materials, UWM Mss 85, University of Wisconsin-Milwaukee Libraries, Archives Department (hereafter Bird manuscript). ^ John Gurda, The Making of Milwaukee (Milwaukee: Milwaukee County Historical Society, 2008), 342. ^ Illustrated Atlas of Milwaukee County (Chicago, IL: H. Belder & Co, 1876) in Bird, “A History of Granville Township,” Bird manuscript, page 1. ^ Bird, “A History of Granville Township,” Bird manuscript, page 28. ^ Rasche, Granville, Wisconsin, 3. ^ Rasche, Granville, Wisconsin, 8; John Gurda, The Making of Milwaukee (Milwaukee: Milwaukee County Historical Society, 2008), 343. ^ John Gurda, “North Milwaukee No More: Former Industrial Suburb Blends into North Side,” in Cream City Chronicles: Stories of Milwaukee’s Past (Madison, WI: Wisconsin Historical Society Press, 2007), 168. ^ John E. Westburg, Preface to Granville, Wisconsin: A History of a Growing Community by Pamela Rasche (Milwaukee: City of Milwaukee Legislative Reference Bureau, 1973), i. ^ Bird, “A History of Granville Township,” Bird manuscript, page 290. ^ Bird, “A History of Granville Township,” Bird manuscript, page 291. ^ Bird, “A History of Granville Township,” Bird manuscript, page 292. ^ Edmund C. Carnes, “The Political Act: Its Application to Annexation, Third Party Attack, and Corporate Authority,” Marquette Law Review 47, no. 1 (Summer 1963): 72. ^ “Merger Test Plight Cited,” Milwaukee Journal, June 1, 1956, https://news.google.com/newspapers?nid=1499&dat=19560601&id=Yx8aAAAAIBAJ&sjid=bCUEAAAAIBAJ&pg=7220,129132&hl=en; “City’s Motion on Granville to Get Study,” Milwaukee Journal, May 8, 1956, https://news.google.com/newspapers?nid=1499&dat=19560508&id=29cjAAAAIBAJ&sjid=gyUEAAAAIBAJ&pg=6676,4469560&hl=en. ^ “Sheriff Won’t Serve a Part of Granville,” Milwaukee Journal, June 11, 1956, https://news.google.com/newspapers?nid=1499&dat=19560611&id=VR8aAAAAIBAJ&sjid=eyUEAAAAIBAJ&pg=4755,132280&hl=en. ^ Rasche, Granville, Wisconsin, 10. ^ U.S. Bureau of the Census, U.S. Census of Population: 1950, vol. I, Number of Inhabitants, U.S. Government Printing Office, Washington, DC, 1952, accessed December 2015; John Gurda, Discover Milwaukee Catalog: Overflowing with Information about History, Homes, Character, Resources of Milwaukee and Its Neighborhoods (Milwaukee: Department of City Development, 1986), 154. ^ Gurda, Discover Milwaukee Catalog, 158. ^ Andy Tarnoff, “Inside a Ghost Mall: Northridge Sits Quietly, Unknown Future Ahead,” OnMilwaukee.com, January 4, 2012, accessed December 2015; Gurda, Discover Milwaukee Catalog, 154. Bird, Miriam “Mimi” Y. A History of Granville Township. [s.l]: M. Bird, 1996. Carnes, Edmund C. “The Political Act: Its Application to Annexation, Third Party Attack, and Corporate Authority,” Marquette Law Review 47, no. 1 (Summer 1963): 71-83. McCarthy, John M. Making Milwaukee Mightier: Planning and the Politics of Growth. DeKalb, IL: Northern Illinois University Press, 2009. Rasche, Pamela. Granville, Wisconsin: A History of a Growing Community. Milwaukee: City of Milwaukee Legislative Reference Bureau, 1973.